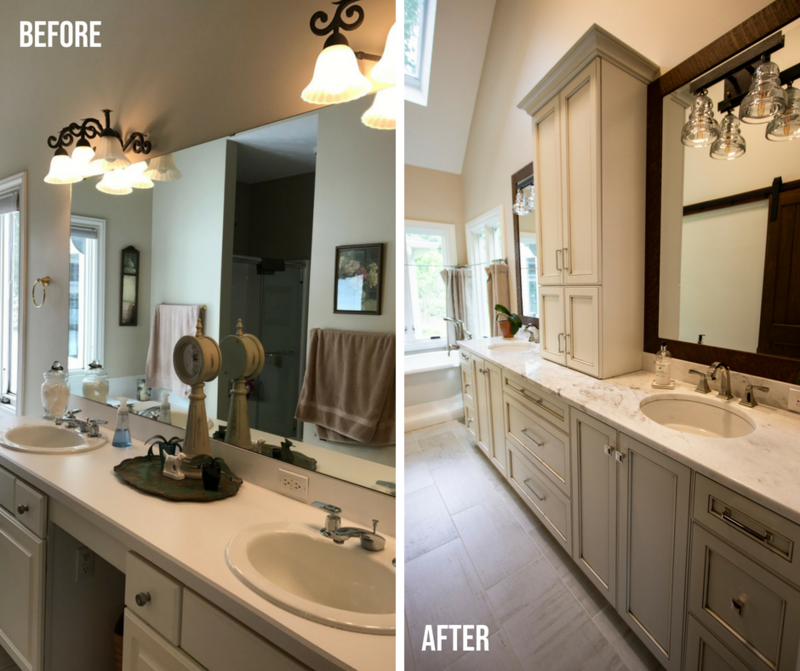 While the rest of this home is traditional the master bath has an eclectic style. You can find traditional elements mixed with rustic and even industrial. Eclectic style shows off personality as it is an opportunity to fill a space with what you love. The layout of the room remained the same with an updated double vanity with custom cabinetry topped with Calacatta Gold marble. The bulky built-in bathtub has been replaced with a more contemporary freestanding tub. 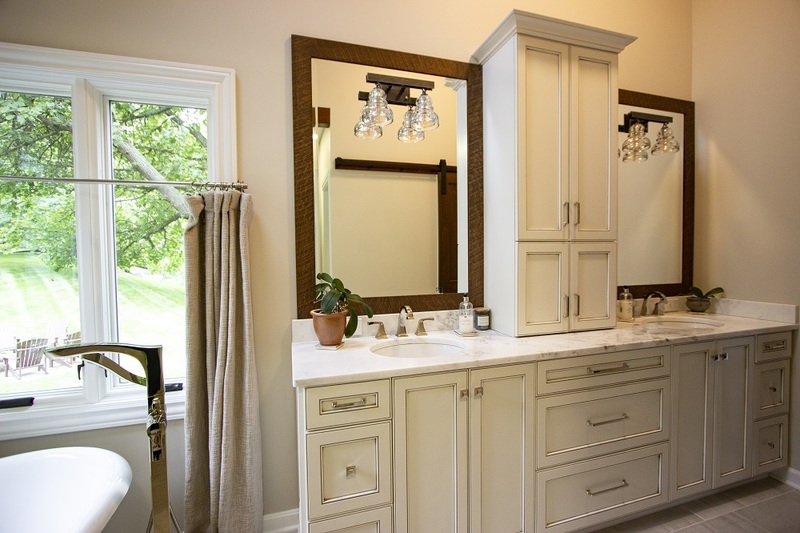 The traditional vanity is offset with custom rustic mirror frames which are pierced with an industrial style light fixture. The frameless oversized mirror has been updated with new custom-made rustic frames. Our woodshop crafted these mirror frames out of quarter sawn white oak with circular saw detailing. The new custom cabinetry provides ample storage space with the addition of the tall center cabinet dividing the Kohler sinks. As the linen closet was no longer necessary in the room it presented a unique space for displaying towel hooks. The custom floating shelves and decor bring out the rustic farmhouse style. 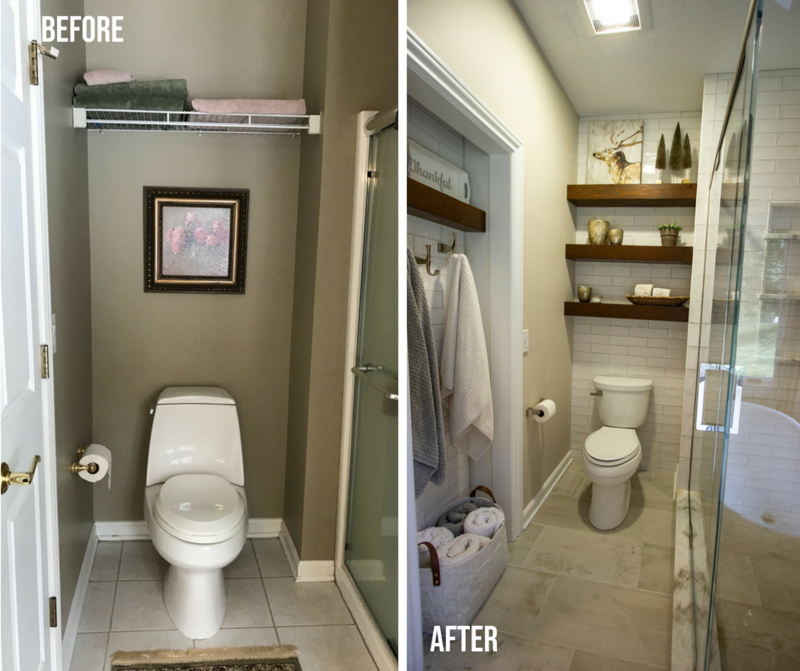 The white subway tile extends from the shower to the toilet wall and the towel niche, which gives the space a cohesive look. 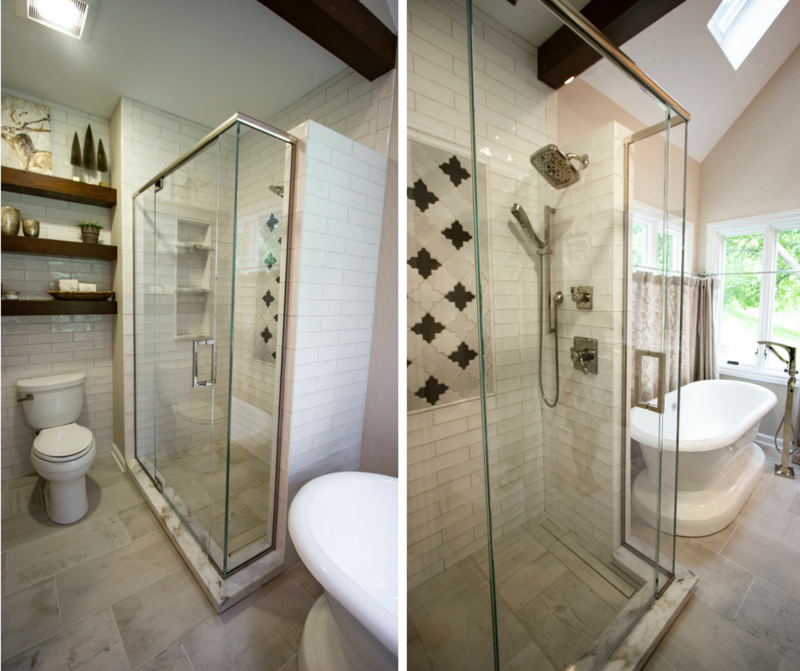 The shower is accented with a beautiful arabesque ceramic tile and fitted with Brizo and Delta fixtures. The porcelain tile flooring has a unique blend of wood and concrete looks and extends into the shower with a linear drain. 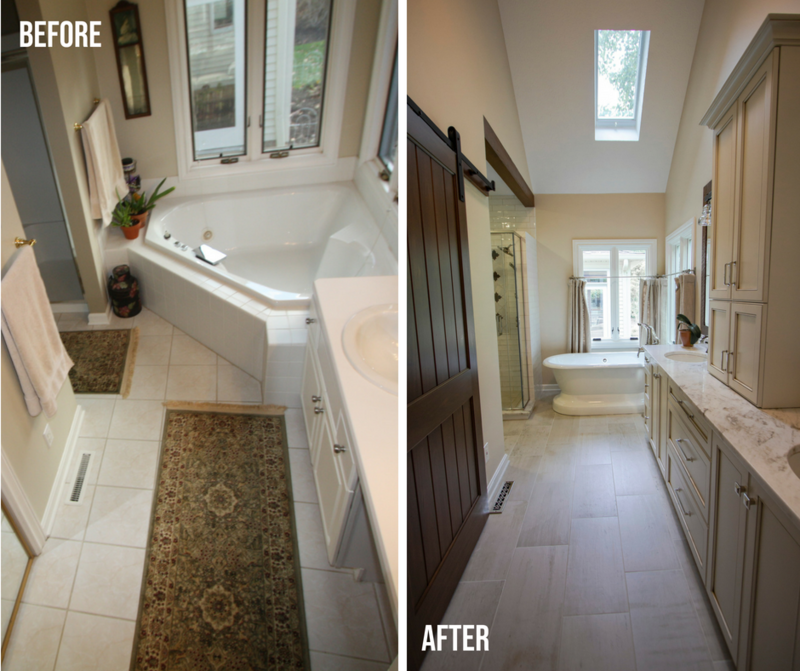 Interested in starting your own remodeling project? We’d love to hear what you have planned. 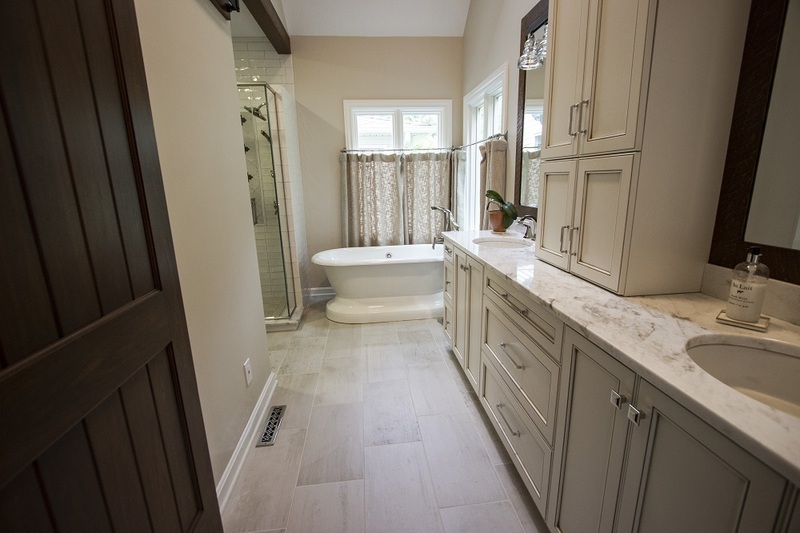 Call 330.225.6000 to speak with a designer today or click here to tell us about your project.